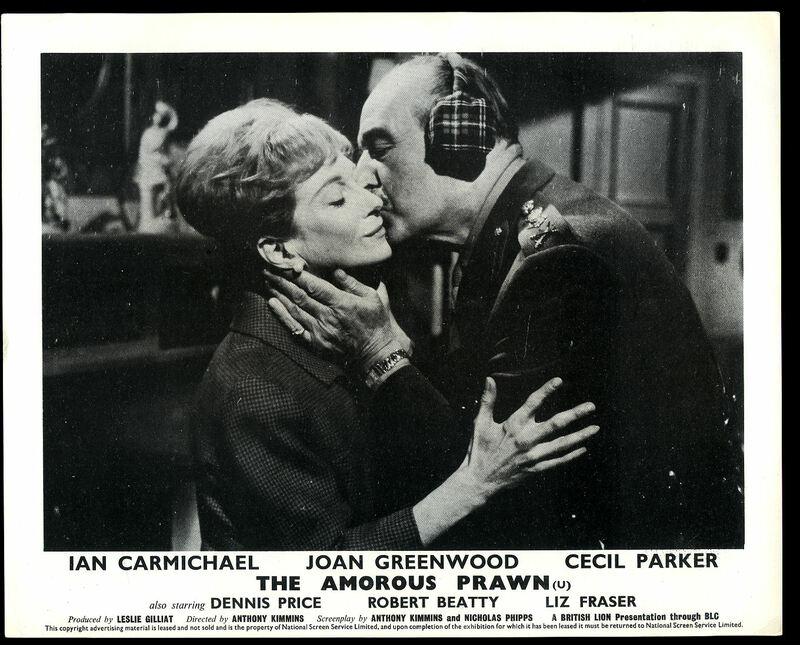 The Amorous Prawn (a.k.a. Girls Take Over): Authentic Original British Front of House Black and White Press Promotional Still Photograph | Lobby Card | Foyer Card For the 1962 Film. Anthony Kimmins (play and screenplay) and Nicholas Phipps]. Produced by British Lion Films 1962. 1962. Black and white press photograph, promotional device resembling lobby card. 8'' x 10''. In Very Good condition. Member of the P.B.F.A. 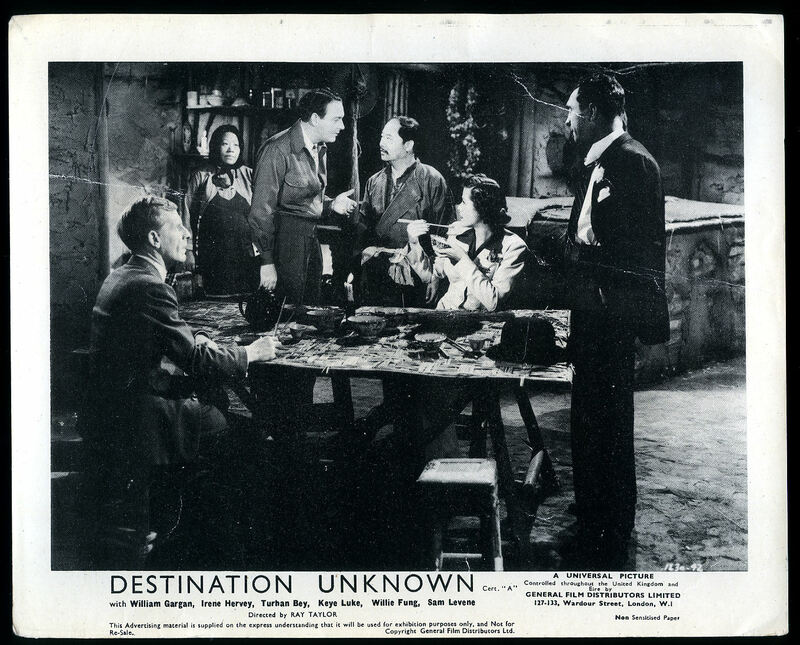 House of Strangers: Authentic Original British Front of House Black and White Press Promotional Still Photograph | Lobby Card | Foyer Card For the 1949 Film. Starring: Edward G. Robinson, Susan Hayward, Richard Conte, Luther Adler, Paul Valentine, Efrem Zimbalist, Jr., Debra Paget [Directed by Joseph L. Mankiewicz, Produced by Sol C. Siegel, Screenplay by Philip Yordan, Based on I'll Never Go There Any More 1941 novel by Jerome Weidman]. Produced by 20th Century Fox 1949. 1949. 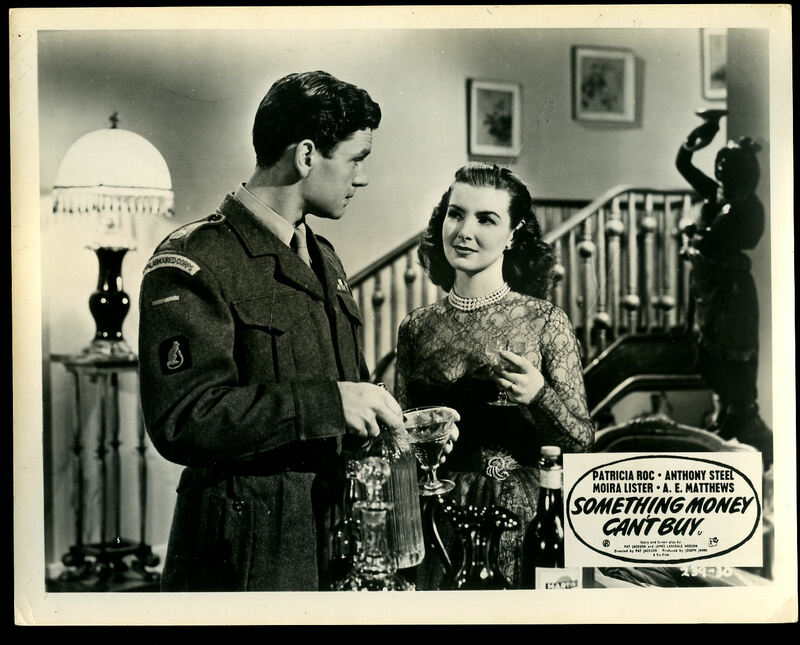 Something Money Can't Buy: Authentic Original British Front of House Black and White Press Promotional Still Photograph | Lobby Card | Foyer Card For the 1952 Film. Starring: Patricia Roc, Anthony Steel, Moira Lister, A. E. Matthews, David Hutcheson, Michael Trubshawe, Diane Hart. [Directed by Pat Jackson, Produced by Joseph Janni, Written by Pat Jackson and J. L. Hodson]. Produced by Vic Films Productions Ltd., 1952. 1952. 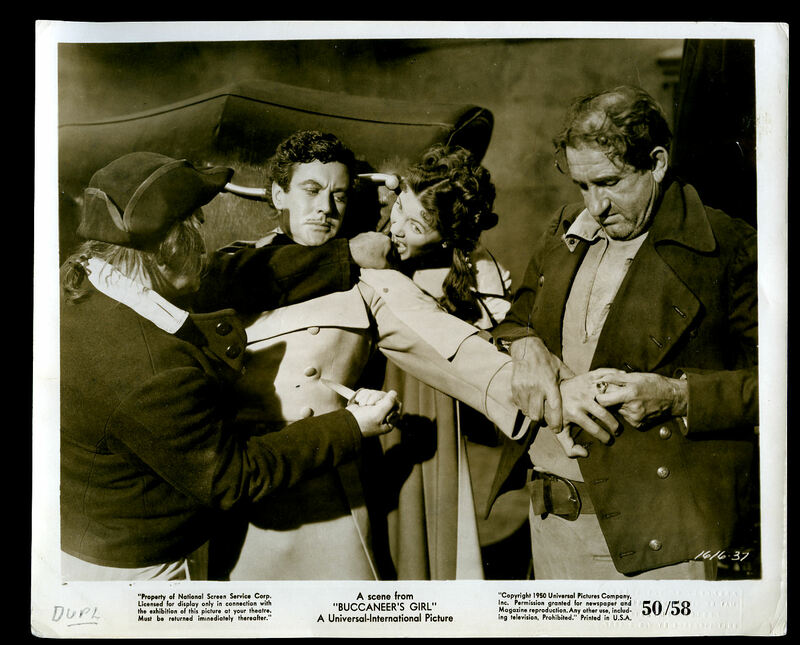 Buccaneer's Girl: Authentic Original British Front of House Black and White Press Promotional Still Photograph | Lobby Card | Foyer Card For the 1950 Film. Starring: Yvonne De Carlo, Philip Friend, Robert Douglas, Elsa Lanchester, Andrea King, Norman Lloyd, Jay C. Flippen, Henry Daniell, Douglass Dumbrille, Verna Felton, John Qualen, Connie Gilchrist, Ben Welden, Dewey Robinson, Peggie Castle [Directed by Frederick de Cordova, Produced by Robert Arthur and John W. Rogers, Written by Joseph Hoffman and Harold Shumate, Based on Story by Joe May and Samuel R. Golding]. Produced by Universal Pictures 1950. 1950. 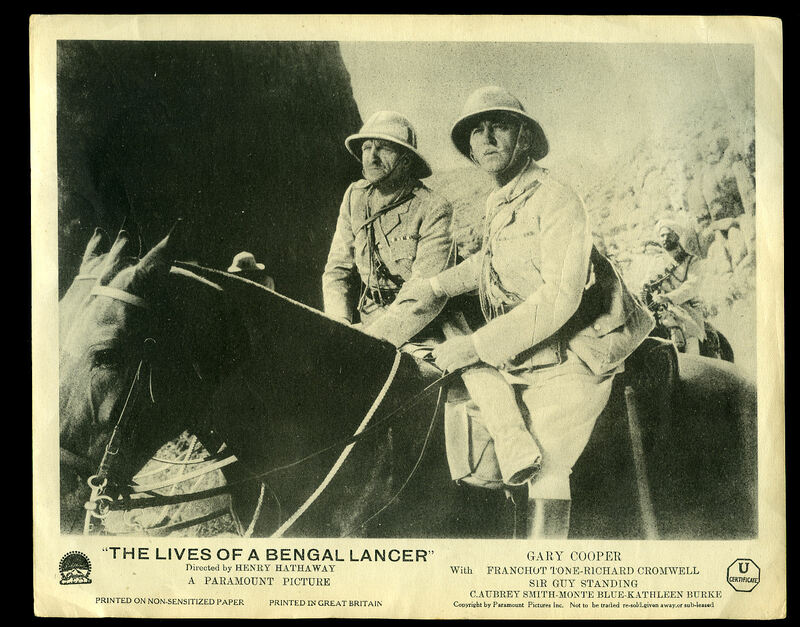 The Lives of a Bengal Lancer: Authentic Original British Front of House Black and White Press Promotional Still Photograph | Lobby Card | Foyer Card For the 1935 Film. Produced by Paramount Pictures 1935. 1935. The Girl Hunters: Authentic Original British Front of House Black and White Press Promotional Still Photograph | Lobby Card | Foyer Card For the 1963 Film. Starring: Mickey Spillane as Mike Hammer, Shirley Eaton, Scott Peters, Guy Kingsley Poynter, Charles Farrell, Kim Tracy, Hy Gardner, Lloyd Nolan, Benny Lee, Murray Kash, Bill Nagy. [Directed by Roy Rowland, Produced by Robert Fellows, Written by Mickey Spillane, Robert Fellows, and Roy Rowland]. Zodiac International Pictures 1963. 1963. 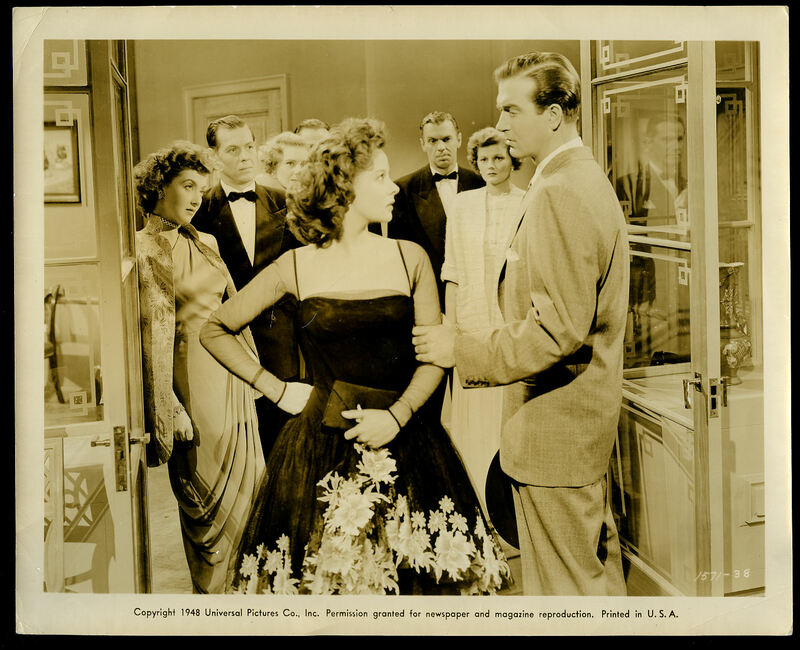 Black and white press photograph, promotional device resembling lobby card. 8'' x 10''. 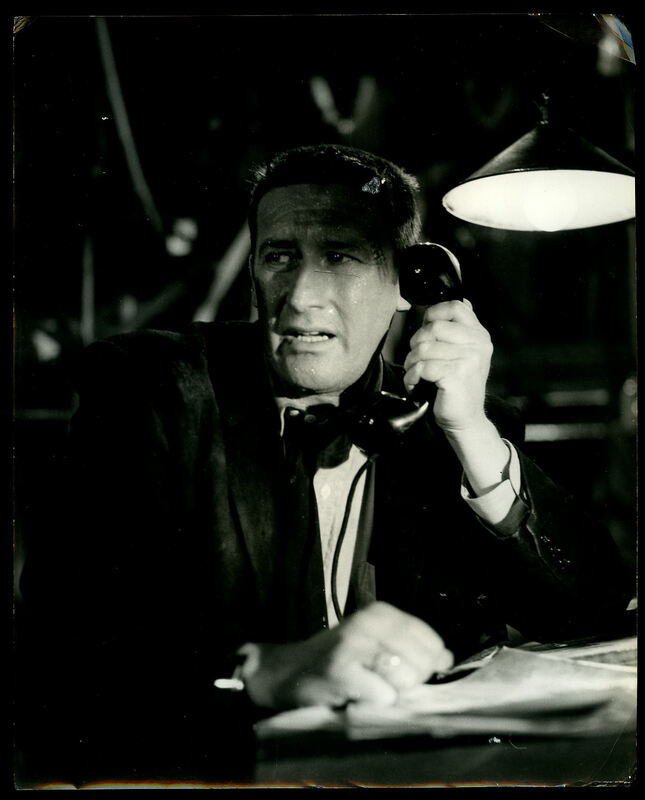 Spillane himself stars as private detective Mike Hammer, one of the few occasions in film history in which an author of a popular literary hero has portrayed his own character. Typed cast list tipped to the rear. In Very Good condition. Member of the P.B.F.A. 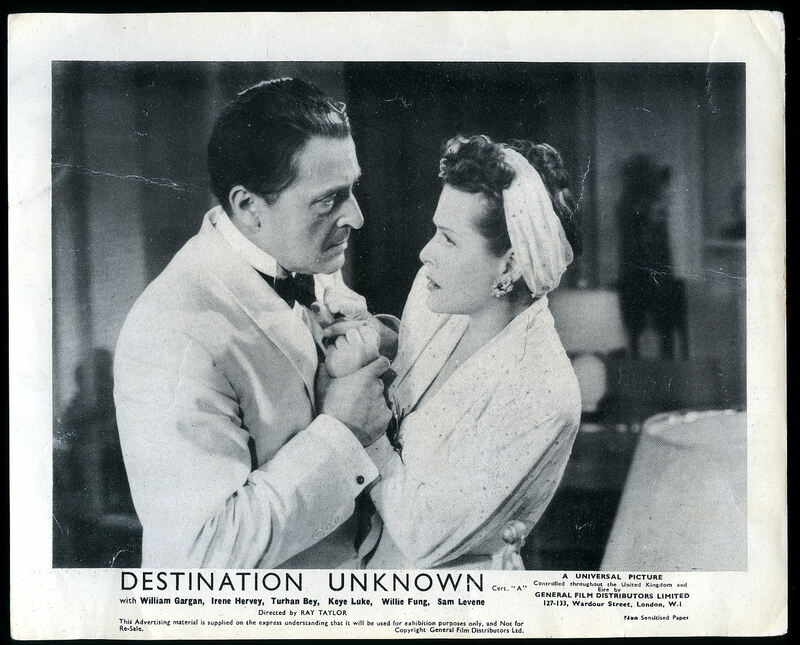 Destination Unknown: Authentic Original British Front of House Black and White Press Promotional Still Photograph | Lobby Card | Foyer Card For the 1942 Film. Starring: William Gargan, Irene Hervey, Sam Levene, Turhan Bey, Keye Luke, Felix Basch [American Film Directed by Ray Taylor]. Produced by Universal Pictures 1942. 1942. 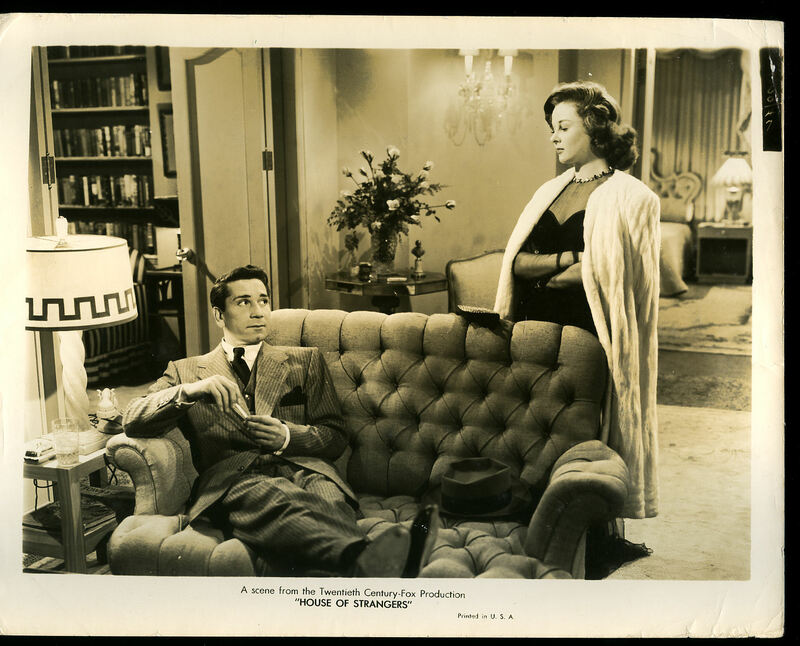 Black and white press photograph, promotional device resembling lobby card. 8'' x 10''. In Very Good condition. Storyline: A beautiful Dutch girl finds herself in Peking being pursued by agents of the Japanese government. Member of the P.B.F.A. The Saxon Charm: Authentic Original British Front of House Black and White Press Promotional Still Photograph | Lobby Card | Foyer Card For the 1948 Film. Starring: Robert Montgomery, Susan Hayward, John Payne, Audrey Totter [Directed by Claude Binyon, Produced by Joseph Sistrom, Written by Frederic Wakeman Sr. (novel), Screenplay by Claude Binyon]. Produced by Universal Pictures 1948. 1948. 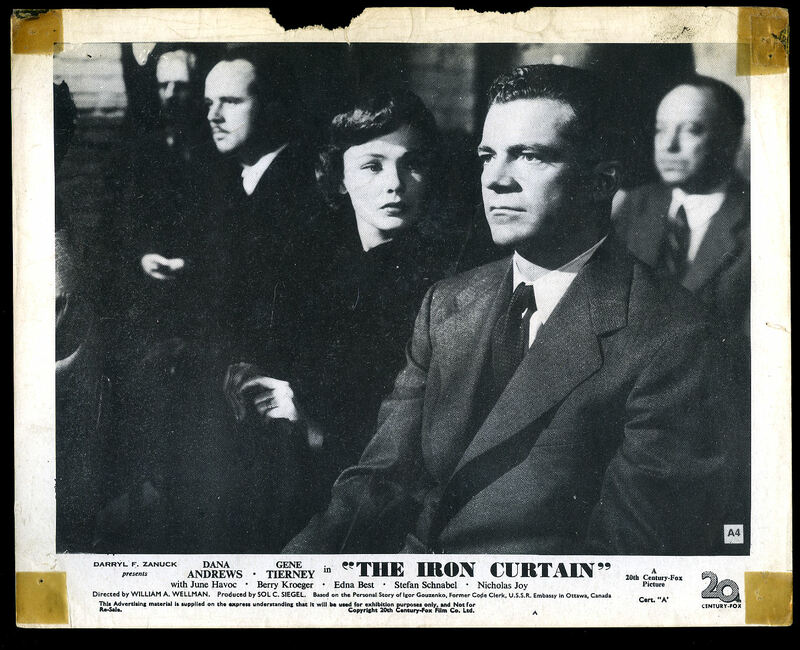 The Iron Curtain: Authentic Original British Front of House Black and White Press Promotional Still Photograph | Lobby Card | Foyer Card For the 1948 Film. Starring: Dana Andrews, Gene Tierney, June Havoc, Berry Kroeger, Edna Best, Stefan Schnabel [Directed by William Wellman, Produced by Sol C. Siegel, Screenplay by Milton Krims, Based on 'I Was Inside Stalin's Spy Ring' 1947 articles in Hearst's International-Cosmopolitan by Igor Gouzenko]. Produced by Twentieth Century-Fox Film Corporation 1948. 1948. 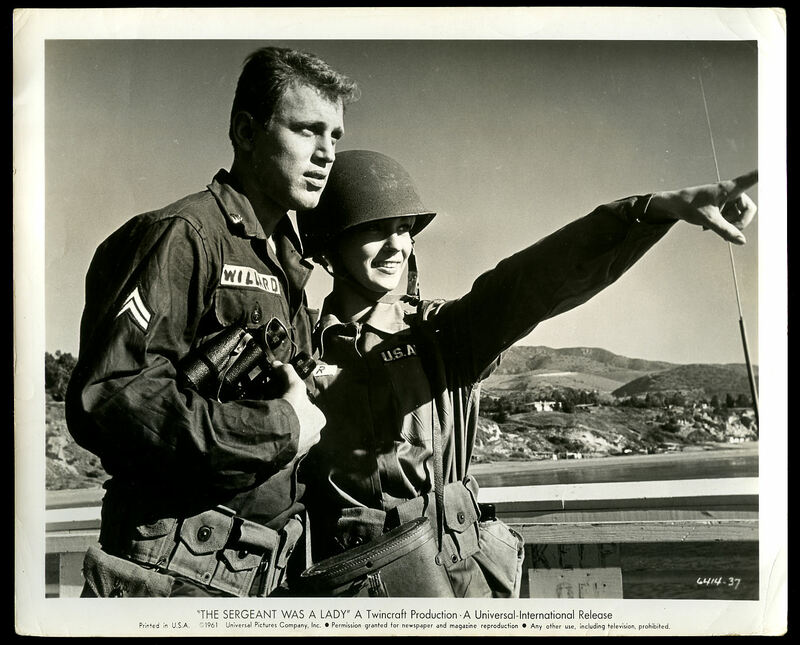 Black and white press photograph, promotional device resembling lobby card. 8'' x 10''. Chip to the top edge, old sello marks to the corners and in Good condition. Member of the P.B.F.A. 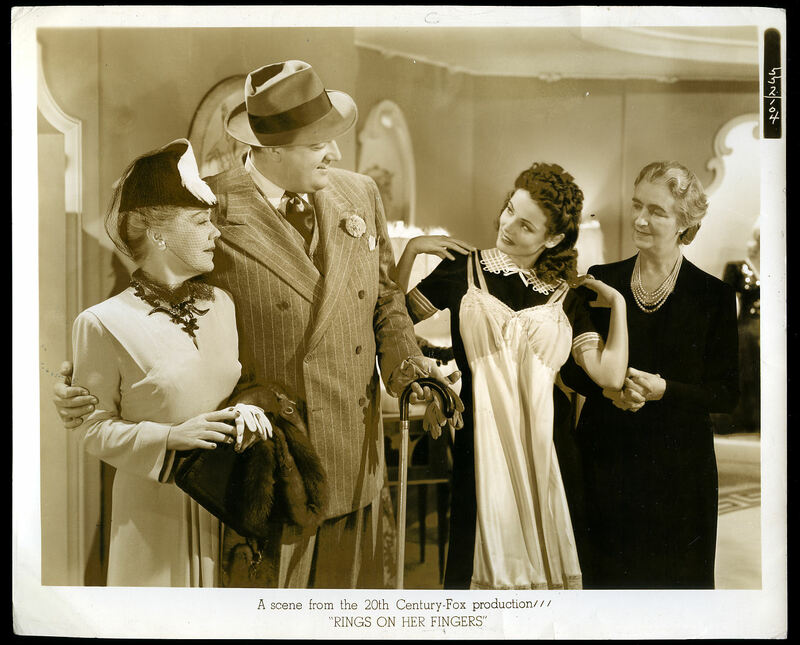 Rings on Her Fingers: Authentic Original British Front of House Black and White Press Promotional Still Photograph | Lobby Card | Foyer Card For the 1942 Film. Milton Sperling, Written by Robert Pirosh and Joseph Schrank]. Produced by 20th Century Fox 1942. 1942. 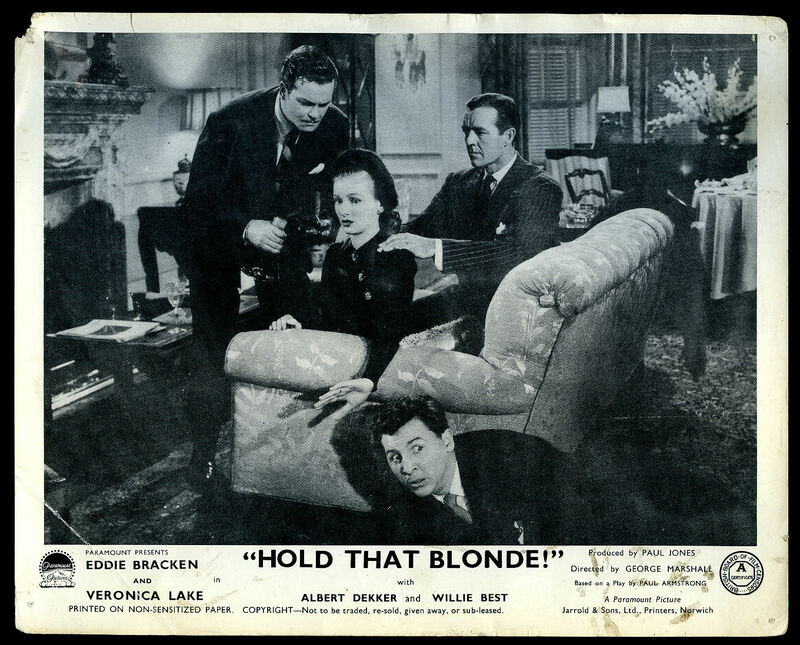 Hold That Blonde: Authentic Original British Front of House Black and White Press Promotional Still Photograph | Lobby Card | Foyer Card For the 1945 Film. Starring: Eddie Bracken, Veronica Lake, Albert Dekker, Frank Fenton, George Zucco, Donald MacBride, Lewis Russell, Norma Varden, Willie Best, Jack Norton [Directed by George Marshall, Produced by Paul Jones, Written by Walter DeLeon, Earl Baldwin, Eddie Moran]. Produced by Paramount Pictures 1945. 1945. 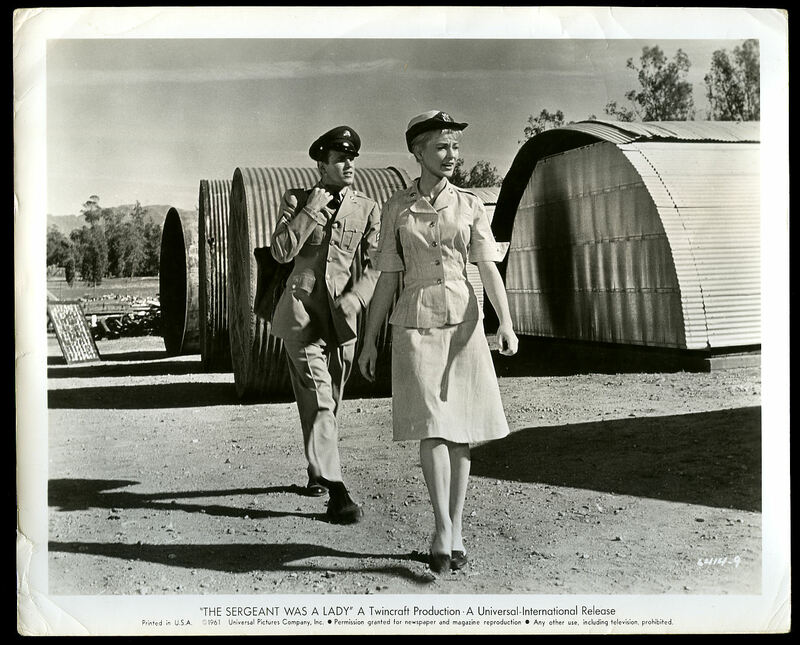 The Sergeant Was a Lady: Authentic Original British Front of House Black and White Press Promotional Still Photograph | Lobby Card | Foyer Card For the 1961 Film. Starring: Martin West, Venetia Stevenson, Bill Williams, Catherine McLeod, Roy Engel and Gregg Martell [Directed, Produced and Screenplay by Bernard Glasser]. Produced by Twincraft Productions Released by Universal Pictures 1961. 1961.